Configuration Management: Theory, Practice, and Application details a comprehensive approach to configuration management from a variety of product development perspectives, including embedded and IT. It provides authoritative advice on how to extend products for a variety of markets due to configuration options. The book also describes the importance of configuration management to other parts of the organization. It supplies an overview of configuration management and its process elements to provide readers with a contextual understanding of the theory, practice, and application of CM. Explaining what a configuration item is and what it implies, the book illustrates the interplay of configuration and data management with all enterprise resources during each phase of a product lifecycle. It also demonstrates the interrelationship of CM to functional resources. Shedding light on current practice, the book describes CM baselines, configuration identification, management baseline changes, and acceptance criteria for end products. It also considers testing, inspection and evaluation, related CM standards, and reference data. Coverage includes the product life cycle, the supporting enterprise infrastructure, functional resources, product management, CM elements, data types, and control requirements. Providing a systems perspective of the various elements of configuration and data management, the book explains how they relate to the enterprise and details proven risk management solutions for when things go wrong. Jon Quigley has worked in a variety of capacities within new product development organizations, including embedded product development engineer, product engineer, test engineer, electrical and electronic systems engineering manager, electrical and electronic verification and test manager, and electrical and electronic process manager. Jon is on Western Carolina University’s Master of Project Management Advisory Board and Forsyth Technical Community College’s Advisory Committee for the Project Management Program. Additionally, he has taught project management at technical schools, Seattle City University, and a number of businesses. He is also an expert at IT Metrics and Productivity Institute (www.itmpi.org), where he has webinars on a variety of topics. Kim Robertson started his first company at the age of 18 and has extensive experience in all aspects of business and aerospace, spanning 40 years. He is the author of over 100 discipline-specific training packages, 3 fiction books, and articles for CM Trends and various other trade publications from industrial arts to configuration management and contract management. His interests in education and training development started in his teens. He is a National Defense Industrial Association-certified configuration manager with degrees from Westminster College in mathematics and physical sciences and a master’s degree from the University of Phoenix in organizational management, with a subspecialty of government contracts. His work experience includes wildlife art, photography, electrical circuit design, manufacturing, learning systems design, systems engineering, configuration management, contracts administration, policy and review, intellectual property, corporate audit, corporate finance, supply chain management, marketing, and public speaking. Kim is an associate of Value Transformations LLC. Data management is challenging not only for quality, logistics, and transparency but also for the engineers or stakeholders making requirements. A big problem in software is that programmers can tend toward perfection and make things better exceeding the approved requirements and if another subroutine uses the same code, strings, variables and algorithms can suffer. In hardware and firmware, changes are often made without documentation or control with same consequences, especially with interfaces. As I tell my folks, just ask what data is needed or desired, ask what reports they need to generate to make decisions, look at the verification and validation requirements. Metadata is more for trends and analysis of those trends but CM data is for status accounting, trace-ability and change control for baseline effectivity. But, you are correct there is a need for this type of book at least to standardize theory, practice and applications of data for quality, life-cycle management, change control, trace-ability, disaster recovery, security (i.e. FISMA requirements), test acceptance criteria, maintenance procedures, operations and logistics of configuration items (CIs). A comprehensive look at Configuration Management and its theories. Well written and laid out to make it understandable, even to inexperienced CM practitioners. A recommended read. "This books takes a broader view on CM than other books on CM. It shows that CM is in much more places than expected." This is not a book for beginners or newbies to configuration management. In a nutshell, CM is everywhere: the clothes we wear, the cars we drive, the coca cola we drink.. It has all been developed using a predefined and tested workflow, making sure the result is standardized. If this is something you have been dabbling in, then this is a book for you. Otherwise.. watch out. I picked this up for my own interest in IT but It gets really advanced really quickly. The first few chapter are entry level but it quickly turns up the pace and it lost me at a point. Nearly half the book I read at high speed because I didn't understand most of the concepts handled. The writing style is pretty typical for this kind of book. Main flow of the writing is clear and fluid but I was annoyed by the number of acronyms used overall. Almost every page (re)introduces acronyms and it's confusing to keep up. Some of the graphs got a bit dull and I missed a bit of color. The themes are all really branched out but still connected at the core. Chapters are built up individually, so you can pick it up where you want to. Conclusion: It's a good book for people in the field but I wouldn't recommend it as an introductory book. Configuration management (CM) is not an easy subject, and it is one of the most complicated processes in IT, while also serving as basis for every other IT (and not only IT) process. 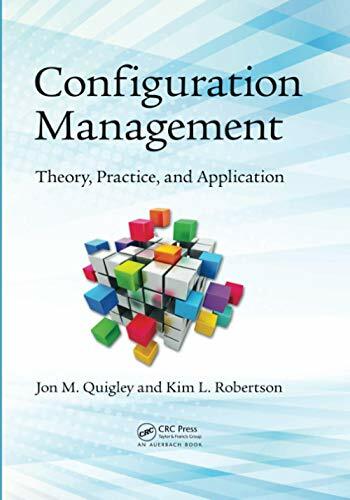 This is a very thorough book, which not only describes the process and particulars of configuration management, but also gives some historical background for the evolvement of CM and particulars of different practices. It also includes case studies and examples of when poorly implemented (or absent) CM lead to major problems and losses in business. The book is well structured and interesting to read if you are willing to take your time to get yourself well-acquainted with the subject. It's easy to see that the authors have put a lot of thought and research into this book. I particularly enjoyed short stories of how CM existed even in ancient times, unbeknownst even to those practicing it. However, I would not call this a reference book, which you can keep on your desk and use it for some daily activities. It is not built in a way that would provide you with templates and a quick reference for finding answers. It includes references as to how CM is done in various frameworks (ITIL, Six Sigma, etc.) but it does not include a deeper analysis of those. If you are interested in specific frameworks you will need to read books devoted to CM within the framework of your choose. This book is not a substitute for them. In my opinion, this book should work well to those who already have had some experience with CM and would like to get a structured introduction and guidance on how to deepen their expertise in the field. Quigley, Jon M./ Robertson, Kim L.
Quigley, Jon M.; Robertson, Kim L.
Quigley, Jon M., Robertson, Kim L.